The Fission Fishing Controller is a third-party fishing controller released by InterAct as an alternative to the Dreamcast Fishing Controller. The two are much the same, although the Fission Fishing Controller makes a reeling sound when used. 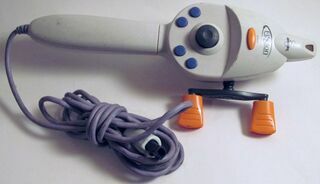 InterAct released similar fishing controllers for the PlayStation and PlayStation 2 around the same period.